In a sane world, we would be very concerned about measuring, reporting and closely regulating methane releases during its extraction and processing, especially if we claim that it is clean energy. This is nothing I, or other people haven’t said before, but here’s more research summarized in the very respectable Nature Journal indicating that measurable leak rates of methane can vary widely. 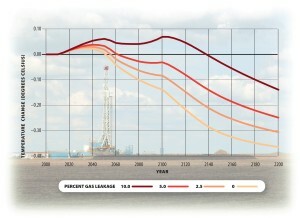 via Methane leaks erode green credentials of natural gas : Nature News & Comment. 10% is a large number. I’ve posted this picture from Wigley (2011) previously. At any leakage rate other than zero, which no one claims, the benefits of switching from coal to methane are very modest. We absolutely need to measure, control and regulate fugitive methane emissions from every BC site, and need to have solid regulation in place before we keep expanding natural gas infrastructure. We need our political leaders to start talking seriously about capturing methane leaks when they talk about BC’s natural gas “play”.